Can you believe they are trying to build a Sun on Earth? 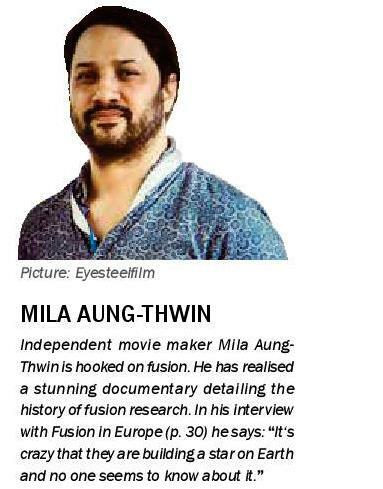 – Director Mila Aung-Thwin was amazed when he first heard about ITER. He immediately felt the need to tell the story of the fusion quest and began to work on a documentary. Four years and four visits to the ITER site later, the movie “Let there be light” is currently screening at some of the most famous film festivals worldwide. It highlights ITER as one of the few good things that came out of the Cold War when, in 1985, Gorbachev and Reagan agreed to build a joint nuclear fusion experiment. Fusion research has always been collaborative. Although the tokamak was born in Russia, Eastern and Western scientists decided to declassify their work in the late 1950s. “Bringing the Sun down to Earth had seemed like just another utopian Soviet concept, but it has survived as a possible solution to solve mankind’s energy needs”, says American artist Emily Newman who has recently realised a project about fusion pioneer Viktor Golant from Saint Petersburg. While artists tell stories about all the lives that have been dedicated to fusion, the world’s largest tokamak grows in the fields of Provence in France. Did you know that some of its magnets are produced directly on site because they are too heavy to be shipped? Fusion in Europe monitors the progress and takes a look at the manufacturing of the Poloidal Field Coils inside the Winding Facility on ITER’s soil. It is not only a tokamak that is capable of mimicking the Sun, a stellarator can do this as well. As flexible as EUROfusion is, its experts now have the opportunity to dive deeper into the plasma produced by Wendelstein 7-X. The most developed stellarator is about to be switched back on in summer, after the installation of a divertor and graphite tiles. These changes will allow the energy input to be increased considerably. Have you ever considered a material that is able to withstand the temperature and the particle fluxes of the Sun? Such ideas play a major role in the thrilling task of bringing the Sun down to Earth. A superconducting magnet, as heavy as three elephants, is now the superhero in EUROfusion’s Dutch Research Unit DIFFER. It enables the material testing device Magnum-PSI to create conditions similar to those in the ITER divertor. Big science, quite literally. But why do only a few people know about this? 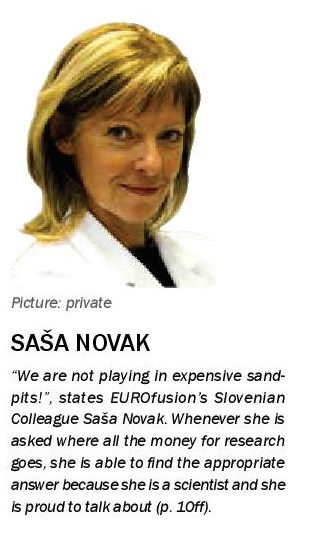 Our Slovenian colleague, Saša Novak, thought about this for a long time. When she started work, she did not want to bore other people in their spare time with her lab reports. After being trained in communications, she decided to speak out in favour of research and what it does for everyone’s daily life. In fact, many spin-offs have resulted along the journey to ITER and beyond. The retiring Director of Energy in the European Commission, András Siegler, names Magnetic Resonance Imaging (MRI) in medicine as one of the most famous results. “There must be more. 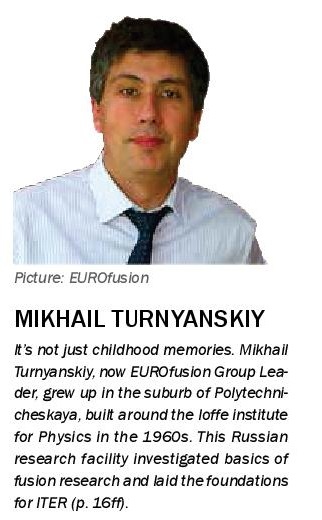 Fusion has paid off far sooner than most people believe”, he says in his farewell interview.